Shuttle crews from the 1980s recall how their new vehicle took some getting used to. No one watched the development of the space shuttle with more interest than the people it carried to orbit. A dozen groups of astronauts trained between 1978 and 2011 to fly as shuttle pilots, mission specialists, and payload specialists. Here some of them recall their feelings as the spacecraft took shape and, later, as they learned to live and work 250 miles above Earth. 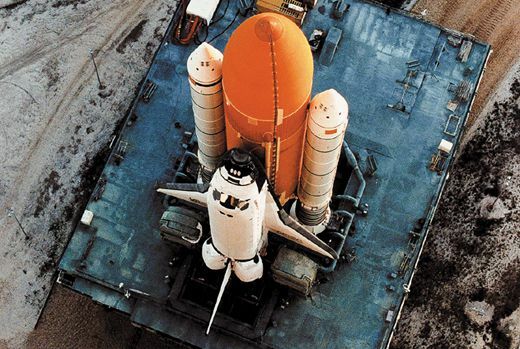 Back in 1972, it was impossible to think that the shuttle’s solid rocket boosters would work. We didn’t have solid rockets anywhere near that size, and they kept getting even bigger as the shuttle design kept getting heavier. By 1972, they were horrendously big compared to anything that had ever been thought of. I knew the military was aghast that we were doing this, because they did not have a good record with solid rockets even a fraction of that size. So I expected the worst. What you’re doing is bolting a very beautiful butterfly onto a bullet. The whole concept was frightening. I was scared for a decade about how things were going to work. Pictured above: Attached to its fuel tank and twin solid rocket boosters, Discovery heads for the launch pad in January 1997. In August of 1977, Fred Haise and I were the crew for Enterprise’s first free-flight approach and landing test—the very first instance of a shuttle orbiter flying solo in the atmosphere. Our 747 carrier aircraft, with the orbiter on top, climbed to somewhere around 25,000 feet and pushed over. Fred hit the button to initiate the separation, seven explosive bolts released us with a loud kabang, and as predicted, we went straight up. We literally dropped the 747 at separation. A chase plane flying alongside us called “vertical clear” as soon as he saw us clear the 747’s tail. Then we started a right shallow turn, and the carrier started a shallow left turn. Very soon thereafter, another chase plane called “lateral clear,” meaning we were clear to push over and start getting the orbiter’s nose down for the approach and landing. So Fred was doing all that. But even before we cleared the tail—immediately after the release—one of our four general-purpose computers, the heart of the orbiter control system, had failed. I saw a big “X” on one of the displays in front of me, so it was clear it wasn’t getting current information. The procedure for a GPC fail, which we had practiced a lot, was for the copilot, which was me, to pull some circuit breakers and turn off some switches having to do with the sensors that went through that particular computer. I referred to a cue card on my instrument panel, and I suddenly got very busy, turning around backward to pull circuit breakers on a panel behind my right shoulder. I did all that, and made the call to Fred when I finished. Then I realized, kind of as a shock, “Hey, wait a minute! We’re flying great. 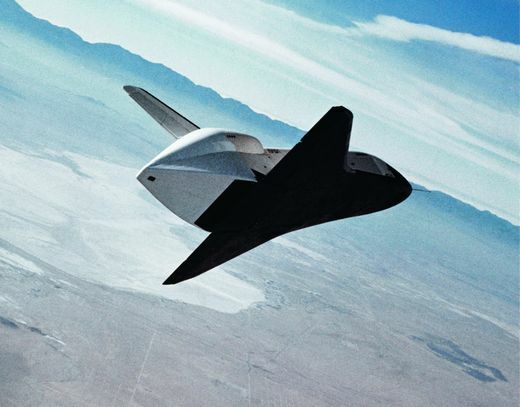 It’s stable and Fred is right on plan.” I missed the whole first part of the flight, which of course was the big thing we were testing: how the shuttle flew as an airplane. We were probably down to 15,000 feet by the time I was back looking out the windshield to see what was going on. Pictured: Enterprise heads for a desert landing during an atmospheric test in 1977.